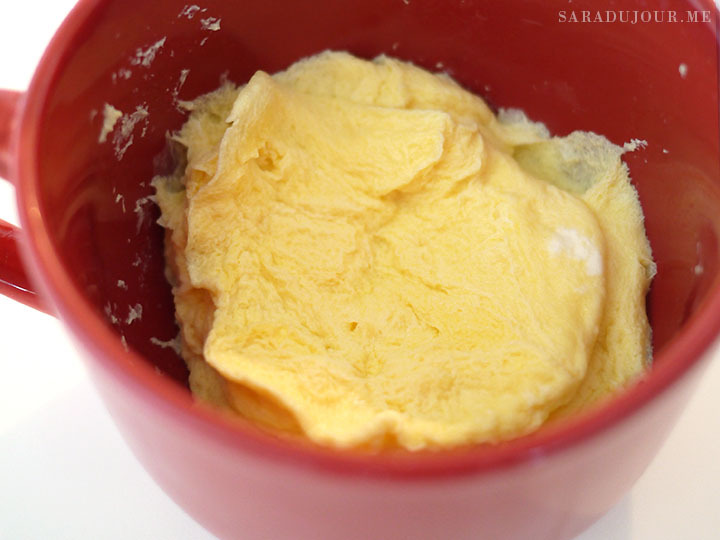 It all started with a question: can you microwave an egg? I did what anyone with a thought in their head and working internet connection would do: I Googled it. 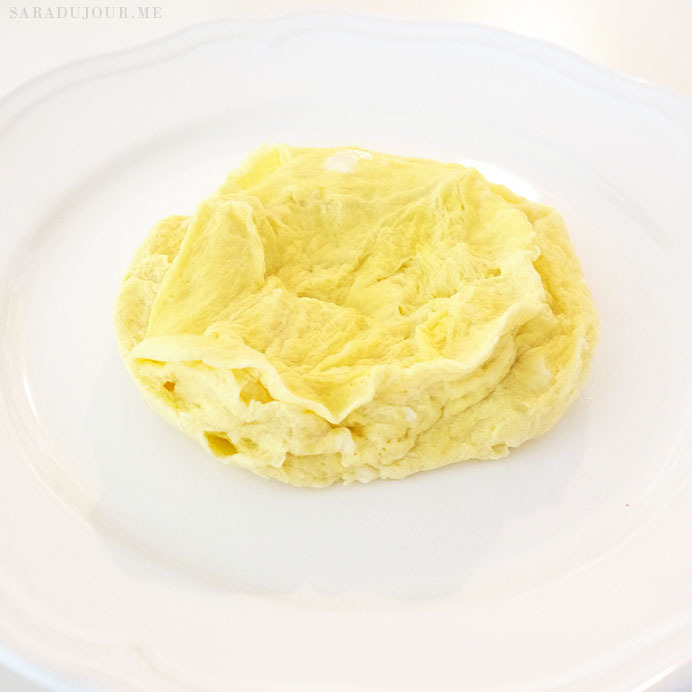 As it turns out, you can microwave an egg. 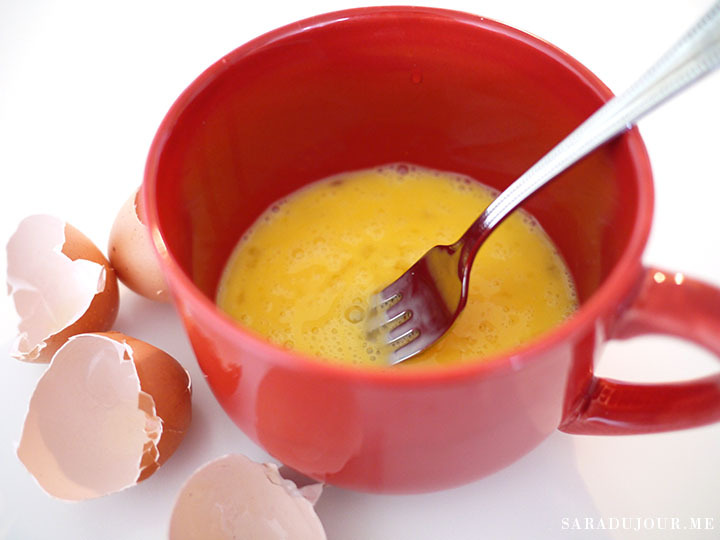 I skimmed through a few recipes that included this method, from quiches to complex frittatas, some of which were made in a mug. When I saw that, an idea began to take shape in my mind, and a recipe was born. 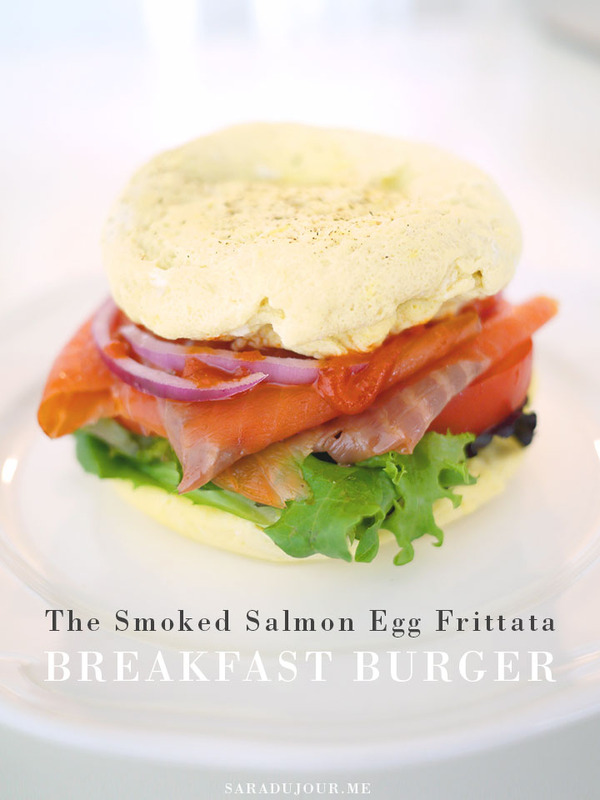 I call it the Smoked Salmon Egg Frittata Breakfast Burger, and it’s ah-maz-ing. All you need are a few ingredients, a mug, and a microwave. It’s no fuss, no-mess, and requires very little clean up because there are no greasy pans to deal with. Plus, it’s super healthy, bread and oil-free, and takes 10 minutes, tops. Are you sold yet? 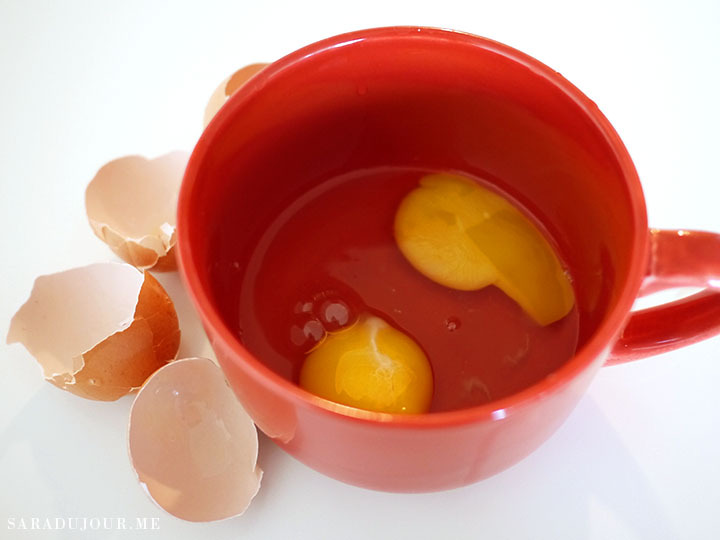 Start by taking two of your four eggs, and cracking them into a mug. 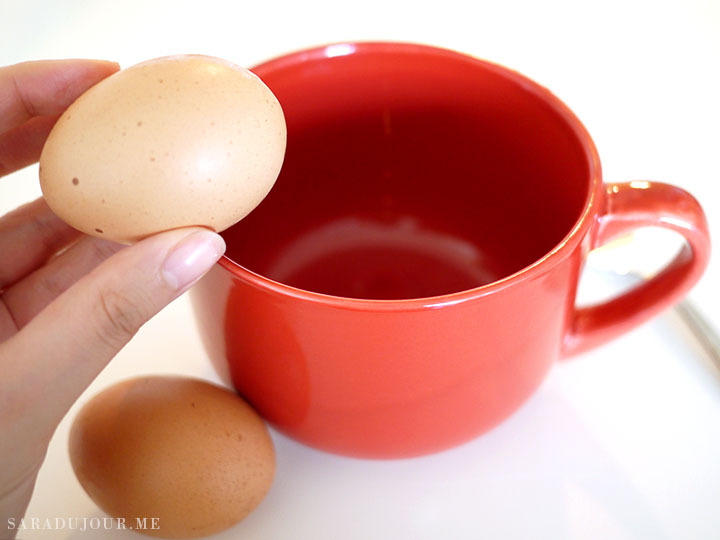 It’s best to use a wide mug with a curved bottom, for the sake of the shape of the egg burger “bun”. You can also use a small bowl instead. Using a fork (or an actual whisk if you’re fancy), whisk those babies up. Add a pinch of salt while you do this. Keep going until you have a smooth, slightly frothy mixture. Add roughly 2 tablespoons of water. 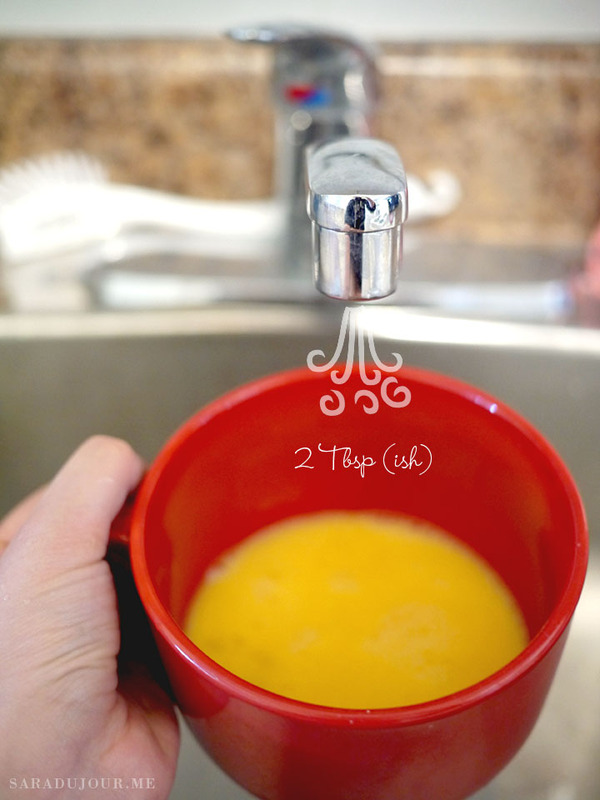 If you put too much, that’s okay, we can drain any excess later. Pull it out, uncover it, and marvel at the fluffy goodness inside. It’s going to look a bit messy at this stage. That’s okay. If there’s excess water pooling at the bottom, drain that out. 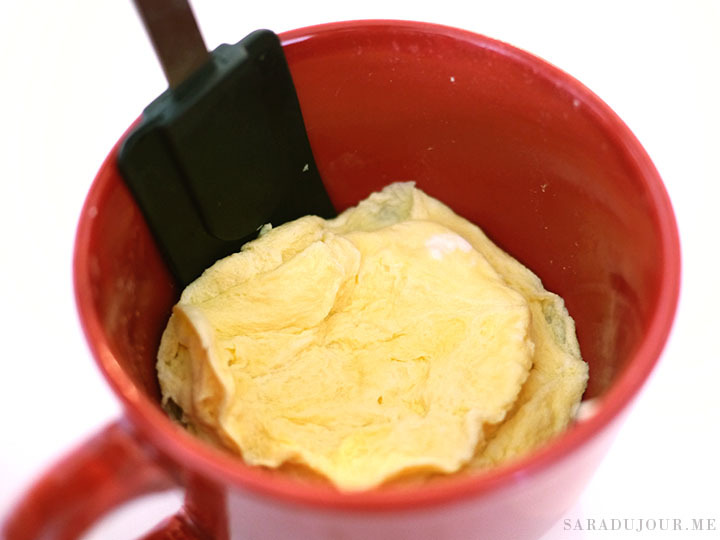 Use a spatula (or if you don’t have that, the back of a spoon) to scrape the sides of the mug down and separate the egg from it slightly. Keep going until the shape is more even and round. Let this rest in the mug for about a minute. Then pull it out and rest it on a plate. This is the bottom half of your breakfast burger “bun”. Now come your burger toppings! 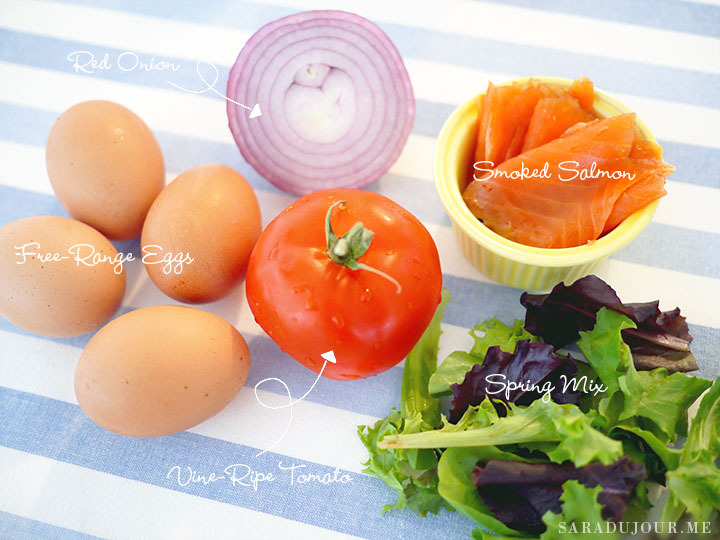 I like to have it with mixed baby greens, tomato slices, smoked salmon, and some red onion. 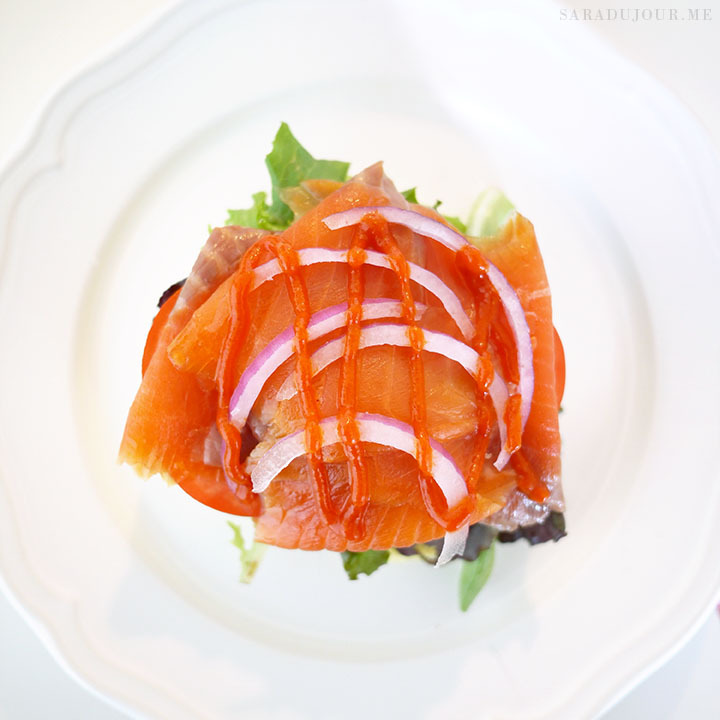 I find red onion complements smoked salmon really nicely. 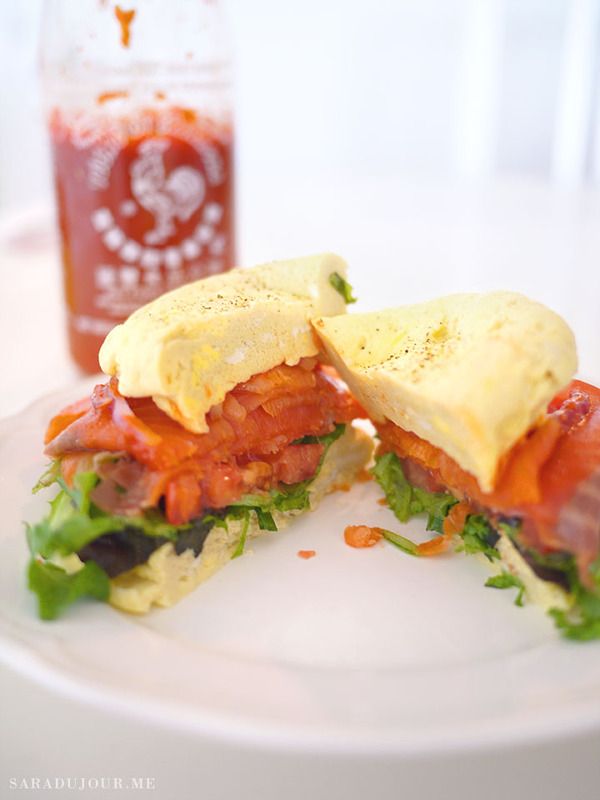 If bacon is more your thing, feel free to replace with that and make yourself a breakfast BLT! Or add some sliced avocado. Have fun, make it your own, and add whatever you like. I also like to drizzle a bit of Sriracha hot sauce on there, because I always add it to my eggs (and actually, most things). This step is optional but it adds a nice kick! 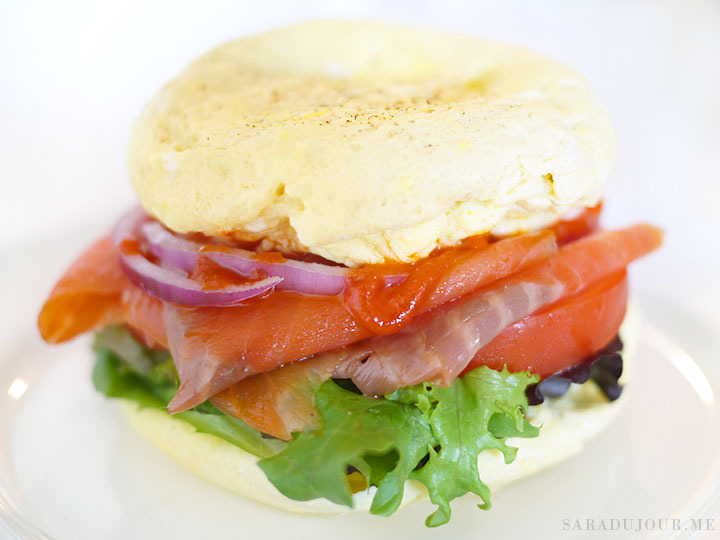 Lastly, repeat the first few steps to create another egg burger “bun”. Flip it over so the round bottom is on top, and complete your breakfast burger. Ta-da! It’s so beautiful, I could cry. I sprinkle a bit of freshly ground black pepper on top, a) for flavour, and b) because it makes the bun on top look a bit like a sesame seed bun. Kind of. If you squint. You can be graceful and eat it with a fork and knife, or pick it up and eat it like a real burger. 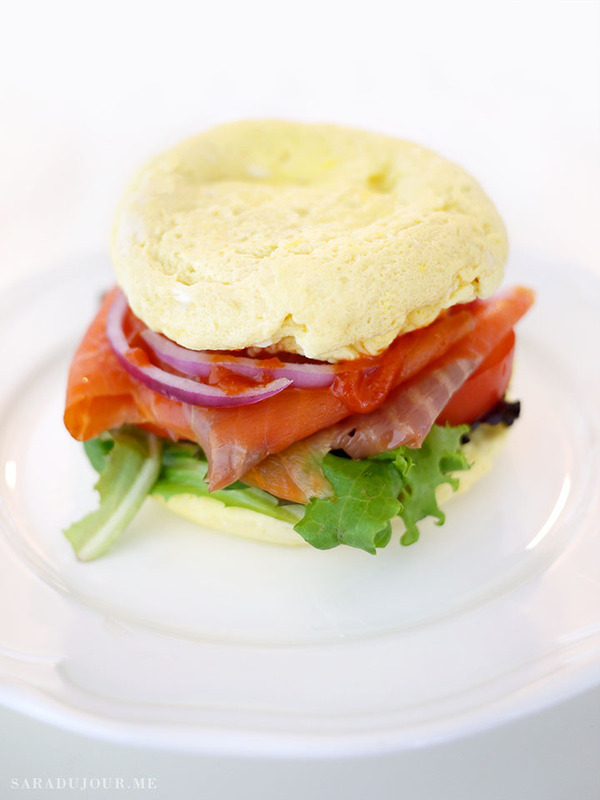 This looks delish and easy to prepare. Thanks for sharing! This recipe looks amazing! I usually eat eggs for breakfast and this seems like an easy way to switch up my usual scrambled!